1. Kalibangan reconstructed image of the citadel and lower town. Computer illustration: Sushi Misal. 2. Kalibangan: Harappan fire altars. 3. 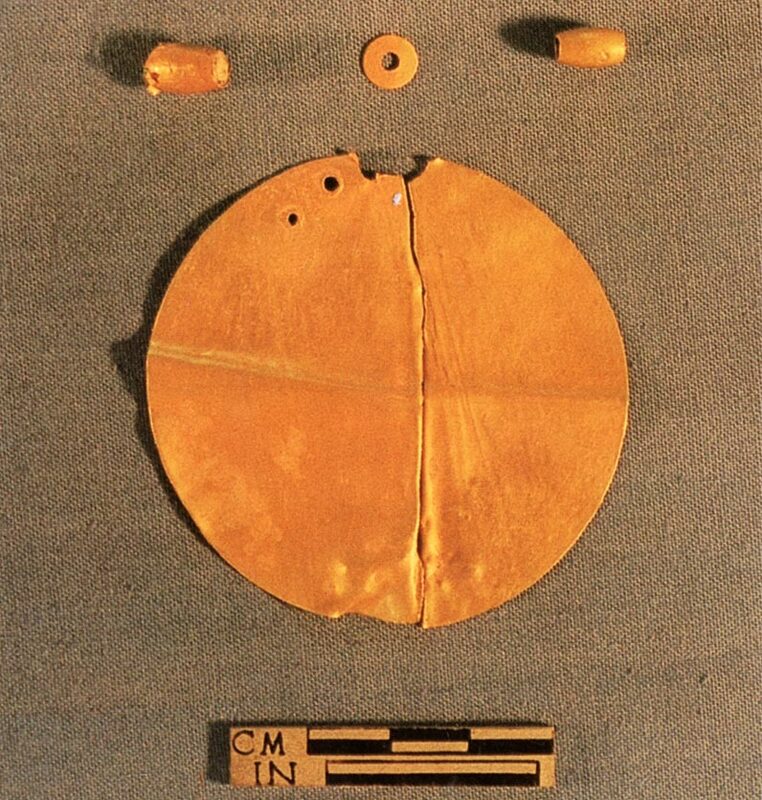 Kalibangan gold objects, early Harappan period. 4. Kalibangan KLB-1: two ovens. "The site Kalibangan - literally 'black bangles' - derives its name for the dense distribution of the fragments of black bangles which were found at the surface of its mounds. . ." writes Madhu Bala. 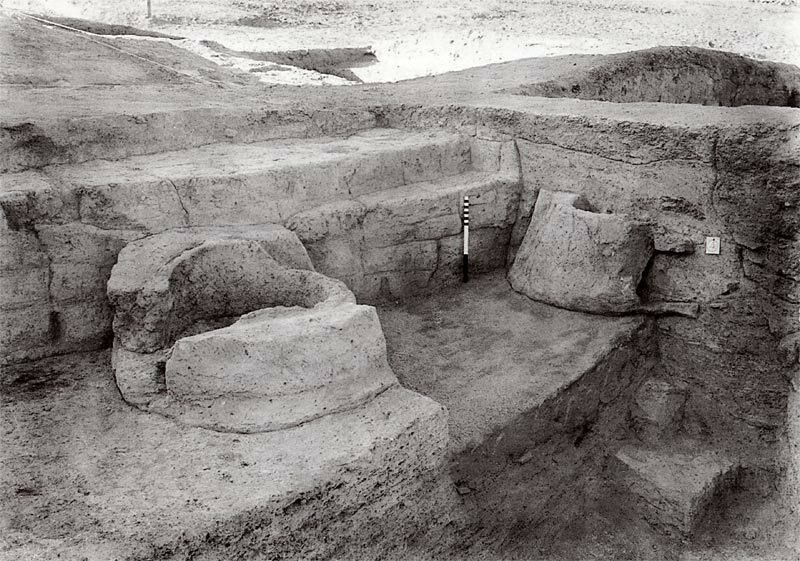 "Evidence of this period consists of a citadel area over the 1.6 metre-thick early Harappan deposit in KLB-1 (the western mound of the site [Image 1]), a chessboard pattern 'lower city' in KLB-2 (the lower and larger eastern mound), and a mound full of fire altars in a much smaller mound further east (KLB-3). The citadel complex of KLB-1 is roughly a parallelogram (240 by 120 metres) divided into two equal parts with a partition wall and surrounded by a rampart with bastions and salients. The basil width of the fortification wall is 3-7 metres. The wall is made of mud bricks in a ration of 4:2:1, with mud plaster on both the inner and outer faces. The southern half of the citadel had ceremonial platforms and fire altars. 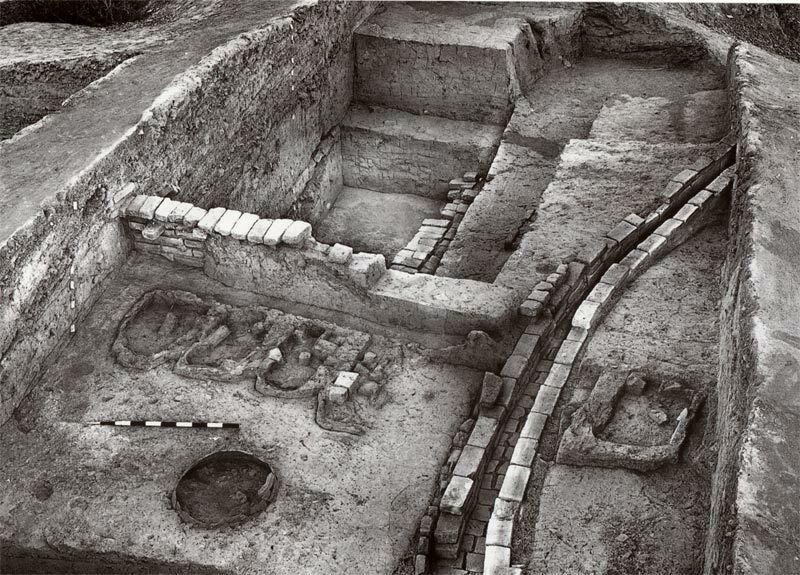 Fire altars were also built in residences where a room was apparently earmarked for them [Image 2]. The altars were renewed from time to time as the general level of the site became higher. There were two entrances to the Kalibangan citadel complex, one to the north and the other to the south. The southern entrance has a brick structure about 2.6 metres wide with oblong salients on both sides of the step of the entrance. The northern structure has a mud brick staircase. The northern half of the citadel area complex had a street, and housed the elite. In the southern half fire altars were arranged in a row on top of platforms constructed for this purpose. Stairs provided access to the top, and the ground around the platforms was paved with bricks. 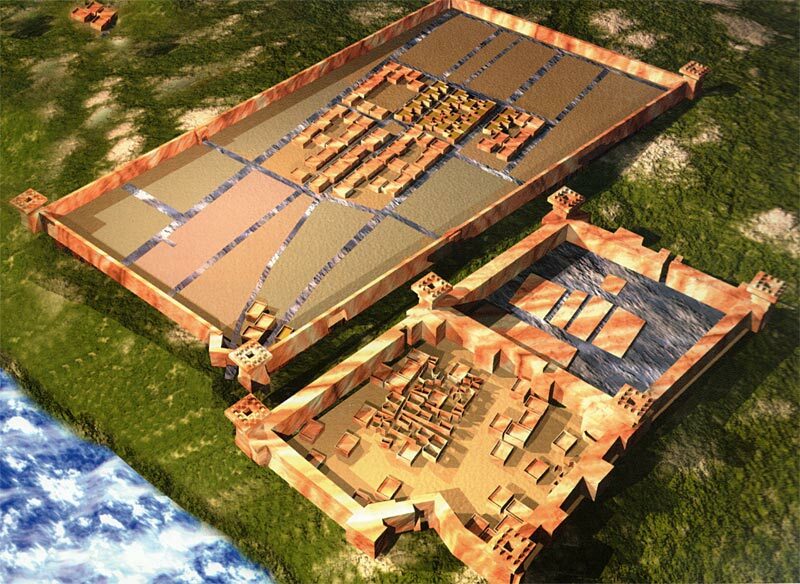 The lower city (KLB-2) was also fortified and laid out in a chessboard pattern, and built of mud bricks of the standard 4:2:1 proportion. The basis shape is that of a parallelogram measuring 235 x 360 metres. The basal width of the fortification wall is 3.5-9 metres. The streets run north - south and east -–west, dividing the area into blocks, and are connected to lanes. There were mud brick rectangular platforms by the side of the roads. Wooden fender posts were intended to ward off damage to street corners. House drains of mud brick and wood discharged into jars in the streets, above the ground. In some areas the streets were paved with terracotta nodules. The lower city had entrances on the northern and western sides. Each house consisted of six or seven rooms, with a courtyard or a corridor between the rooms. Some rooms were paved with tiles bearing designs. KLB-3, the isolated easternmost mound, has brought to the surface a row of fire altars, and this find, along with the remains of fire altars in KLB-1 mentioned above is clear evidence that fire altars played a major role in the religious life of the people." "Interesting evidence regarding cooking practices is revealed by the presence of both underground and overground varieties of mud ovens inside the houses [Image 4]. These ovens closely resemble the present-day tandoors in the region of Rajasthan and Panjab. The underground variety was made with a slight overhang near the mouth, while the overground ovens were given a bridged side opening for feeding fuel and were plastered periodically. The ovens were perhaps used for baking bread, as the Kalibangan residents were mainly wheat eaters. The wheat grains were most likely stored in cylindrical pits lined with lime plaster, which have been discovered at the site." (Kalibangan: Its Period and Antiquities, p. 34, 39, 40-41 in Indus Civilization Sites in India New Discoveries edited by Dilip Chakrabarti, Marg Publications, Mumbai, 2004). All photographs courtesy The Archaeological Survey of India.